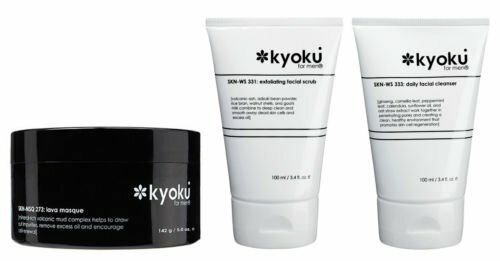 Package Includes Kyoku for Men Daily Facial Cleanser, 3.4 Fluid Ounce Kyoku for Men Lava Masque, 5 Ounce Kyoku for Men Exfoliating Facial Scrub, 3.4 Fluid Ounce Exfoliating Facial Scrub Designed especially to deep clean pores, get rid of blackheads, free ingrown hairs, prevent blemishes, and remove excess oils-giving you a more youthful, vibrant appearance. Exfoliating: volcanic ash pulls excess oils and toxins from the skin while japanese adzuki bean powder gently exfoliates to remove dead skin cells and ingrown hairs that can clog pores. 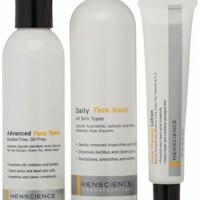 Toning: rice bran is an ancient Japanese secret for smooth, soft skin. It is said to prevent wrinkles, quickly heal blemishes, absorb dirt and oil from pores, balance the natural oils in the skin, and moisturize. Exfoliating: Volcanic ash pulls excess oils and toxins from the skin while Japanese adzuki bean powder gently exfoliates to remove dead skin cells and ingrown hairs that can clog pores Toning: Rice bran is an ancient Japanese secret for smooth, soft skin. 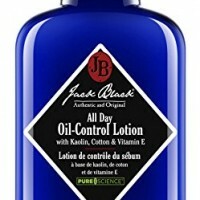 It is said to prevent wrinkles, quickly heal blemishes, absorb dirt and oil from pores, balance the natural oils in the skin, and moisturize Balancing: Vitamin A and vitamin E balance the skin’s PH to promote elasticity and reduce the formation of fine lines and wrinkles Lava Masque Helps stop the deep set inflammation that leads to breakouts & acne in men’s skin through the power of Japanese volcanic mud, volcanic ash, Tahitian black sand and 73 essential sea minerals. 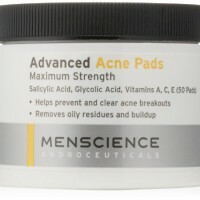 An essential for any guy suffering from breakouts, acne, and wanting completely clear skin. 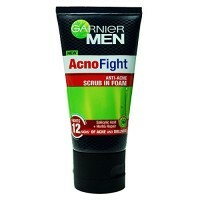 Helps get rid of breakouts & acne by stopping deep set inflammation in men’s skin Kyoku for Men Daily Facial Cleanser destroys acne-causing bacteria in men’s oilier, thicker, and more acne prone skin. It utilizes a host of Japanese antioxidants and anti-inflammatories that penetrate deep down to eliminate acne causing bacteria and inflammation where they start.